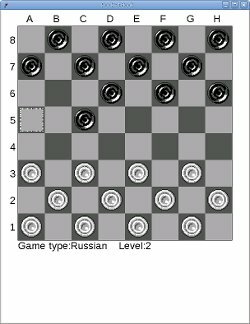 This is cross platform checkers game that supports Russian and English checkers rules It works on Linux,Windows and known to works on Mac OS X.It's also ported to pocketbook 3xx,60x and 90x see pocketbook project at SF. 03-03-2012 yacheckers-1.4.0 is released save history and load games support. 26-02-2012 yacheckers-1.3.2 is released Small bug fixes. 20-02-2011 yacheckers-1.3.1 is released PocketBook Pro 60x-90x support. Small bug fixes. 13-09-2010 yacheckers-1.3.0 is released Add undo/redo for AI game. 28.03.2010 yacheckers-1.2.0 is released - PocketBook 302 support. 11.12.2009 yacheckers-1.1.0 is released - some fixes for PocketBook. 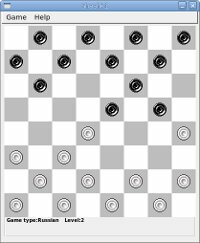 Add 2 players game. 24.07.2009 yacheckers-1.0.1 is released - change colors, add checkers themes, some fixes (PocketBook only). 20.07.2009 yacheckers-1.0 is released - speed improvement some fixes. 01.07.2009 yacheckers-1.0_rc3 released (I belive this is last rc).